Heat a wok over high heat until it is very hot, but not burning. Then add enough oil to generously coat the bottom of it. Swirl the wok so that the oil coats the lower half of the sides of the wok. Then quickly add the ground beef. Allow it to brown before stiring it. Repeat this until the meat is nicely browned and cooked through. Dish out the meat and set aside. There shouldn’t be any extra liquid in the wok, but if there is, you can keep it if you like a wetter, stickier stir-fry. Otherwise, discard the liquid. Add more oil to the wok as necessary, and add the onions. Cook, stirring frequently until the onions are softened and translucent. Reduce the heat if necessary to prevent burning. Add the beef back to the wok, add the kimchi, and stir until they are heated through. Then add the loosened rice and Korean red pepper paste (if using). 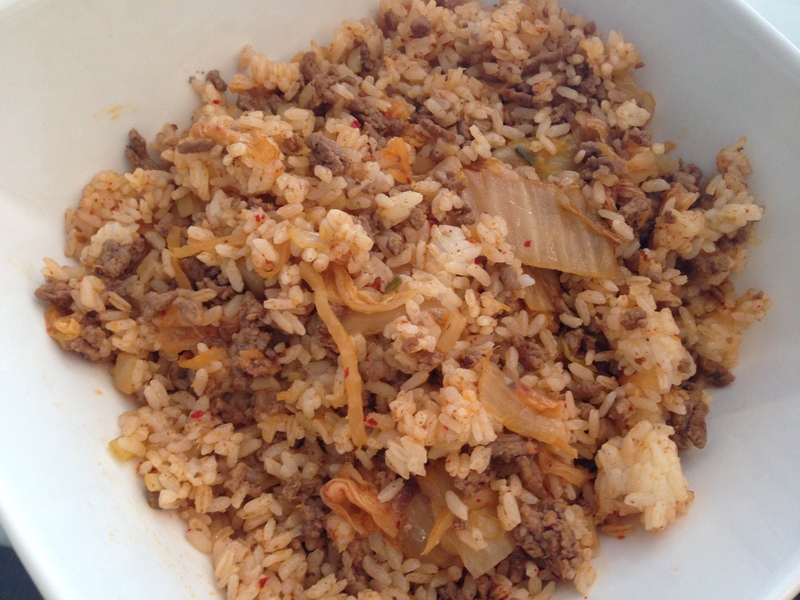 Stir continuously until all of the ingredients are well mixed and the rice is very hot throughout. Add kimchi juice to taste, a couple of tablespoons at a time. Stir to mix well, dish out, and serve immediately.